Many of the trends we wrote of last month are still in effect now. You are still in the midst of a powerful love and social peak until the 22nd. Love will be good afterwards too, but is most active until then. Love and social goals are being attained now. Health still needs watching, especially until the 22nd. Keep in mind our discussion of this last month. 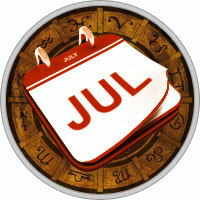 Your health planet went retrograde on June 26 and is retrograde until the 21st. If you are making dramatic changes to the diet, research it more carefully. The same goes for any major change in the health regime. Changes might be necessary but get more information. Jupiter, your spiritual planet, is making beautiful aspects to Saturn this month. So this is a spiritual period for you. You are meeting spiritual kinds of friends and perhaps they are the instrument the cosmos is using. You seem very receptive to spiritual influences this month and this tends to produce new understandings. Singles have many choices in love, but the spiritual dimension - the spiritual compatibility - is most important. Many problems can be assuaged if there is spiritual compatibility. Last month on the 21st the Water element became strong again, and this is the situation until the 22nd of this month. You went through a similar period in February and March. The emotional energy is very powerful now. When emotions are positive things are good. But if they turn negative, and this can happen very easily, it can be very painful. Be more aware of people's sensitivities now: they are hypersensitive. Logic and practicality - your strong points - can be seen as cruel or unfeeling these days. So take this into account when dealing with people; state your case, but with more sensitivity. It is at times like this that your sound judgement is most needed, but will others listen? Finances are still stressful until the 22nd. You have to work harder to achieve your financial goals. On the 17th your financial planet Uranus goes retrograde as well, mean­ing the financial life is under review for most of the year ahead, until December 17. This will not stop earnings, but it does slow things down a bit. The financial judgement is not at its optimum. Handle your normal financial responsibilities but avoid making major purchases or investments. Your job is to attain mental clarity on your finances and this will take time. The financial picture is not as you believe it to be and many assumptions are not correct - as you will find out in the coming months. On the 22nd your spouse, partner or current love enters a yearly financial peak. He or she will most likely make up any short fall. A parent or parent figure has a nice payday on the 19th-20th and seems generous with you too. You have the financial favour of bosses, elders and authority figures that period.